Participants’ commitment to include women and youth. I was greatly motivated by the strong commitments from 30 participants to promote women and youth participation at the end of Oxfam-led session at the Greater Mekong Forum 2016. The Greater Mekong Forum is the regional knowledge sharing platform among government, development agencies, civil societies, the private sectors and researchers in the Mekong region. It’s an annual event convened by CGIAR Research Program on Water Land and Ecosystem (WLE). This year (2016) event was held in Bangkok with at least 350 participants. 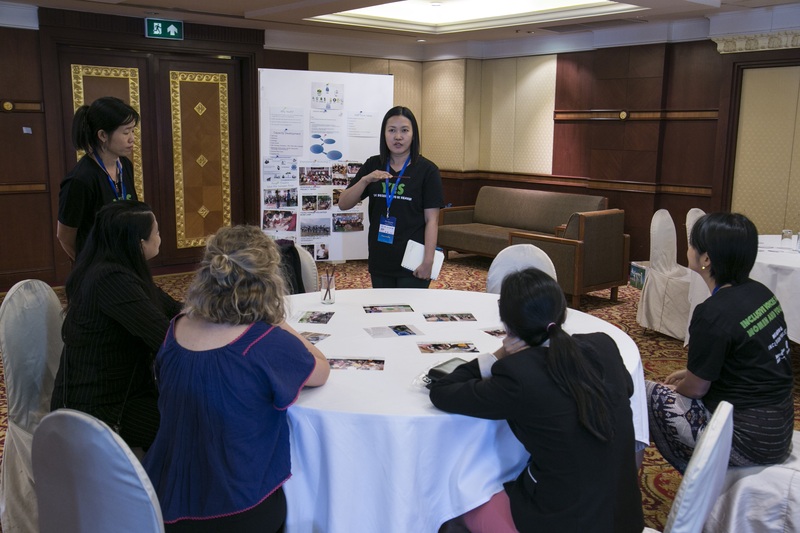 There were 30 sessions hosted under six themes and amongst that, the second theme focused on Gender, ethnic diversity and resettlement in the Mekong Region that has allowed Oxfam to run a session under it, titled ‘The Missing Voices’ to share the stories from women and young people in the region to a wider audience. The session started with sharing stories and experiences of including women and youth from all participants. They identified challenges and successful model to promote women and youth participation. “Including women in our work is very important,” one participant said, but it’s also very challenging. Most of the indigenous women in the communities are illiterate and they speak their own languages which was very challenging to communicate with them and they usually are very shy, lack of confidence to speak their mind out, she added. Another participant from Vietnam shared the importance of involving young people in this project. Young people are very innovative. He shared that it was very successful to involve them in the community adaptation strategy development project. Participants acknowledged the importance of involving women and youth in development. The three speakers from Cambodia, Vietnam and Myanmar shared their experiences to promote women and youth participation in their own community. 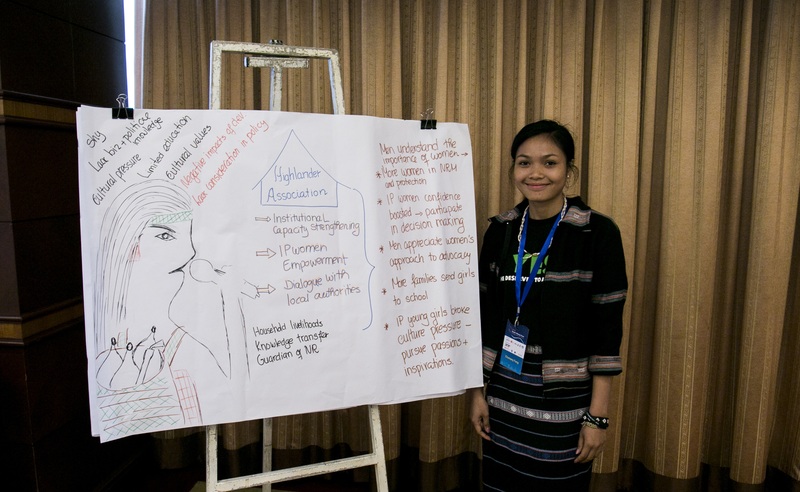 Champey, a young indigenous woman from Cambodia have inspired me and other participants by her own story how she has struggled the discrimination and culture norms that people in community and her family perceived about women. She broke the obstacles and went to school to proof people around her that women can do anything like men. She is now working for an Indigenous People organization, Highlander Association, to support other indigenous women who face inequality like her. She has changed her family’s perspective and is able to motivate other women in the community to actively participate for the well-being of their community, particularly protecting natural resources which are the source for their livelihood. However, she added that the space for women’s participation is still very limited. They still need support from every stakeholder to create enabling space for indigenous women to voice their concerns and ideas. With all this support, I believe that indigenous women also can do things as men, Champey added. Young women from Oxfam’s partner Kalyana Mitta Foundation (Myanmar), Ms. Chan Let Mon shared her experience working with youth in Myanmar. Loi and Chan Let, our young speakers from the Mekong Delta and Myanmar respectively showed us the important role of young people in protecting natural resource which leads to the sustainable development. Young people are very dynamic and innovative. With their innovative ideas and motivation, young people have a great potential to contribute to the well being of the communities, Loi said. The generation gap has to be minimized. They should work together inclusively for their community and country. After directly heard three inspiring stories from firsthand experience young indigenous women and youth, participants came together to commit themselves to work in partner with women and youth to promote their meaningful participation. Copyright © 2019 Oxfam in Cambodia. All rights reserved.